I scheduled a vacation day today. I have quite a few days left to use so I'm taking the next three Fridays off too. I spent most of the day today decorating the house for Christmas. We most likely won't put up the Christmas tree since we have a cat who thinks she's a monkey. Oh well, she's so darn cute, I don't mind not having a Christmas tree. We ate dinner at Modesto tonight. They change their menu every few months so it's a chance to try new dishes. We had the hummus, manchego cheese and olives, meatballs, chicken skewers, stuffed fried olives and sauteed green beans. Bill also had the calamari and I had the chicken empanadas. Of course, we had to have the churros y chocolate for dessert. Yummo! Here is a new Christmas card I created a few weeks ago. I already had my Christmas cards designed and mostly finished but I wanted to play around with my Martha Stewart snowflake punch. I used Papertrey white cardstock for the base. I usually use Whisper White by @Stampin' Up, however, the Papertrey card stock is heavier and works quite well for a card base. I used silver organdy ribbon and then cut a piece of designer paper from the Pool Party line and adhered it to the left side of the card. I cut out three snowflakes, pressed them onto my glue pad so that they were sticky and then dipped them in Dazzling Diamonds glitter which is my most absolute favorite glitter. It's hard to see in the photo but the snowflakes are really glittery (click on the photo and you can see the glitter). I originally tried running them through my Xyron sticker maker but it left big glue globs (yes, that's an official stamping term) between the arms of the snowflakes. Anyway, the sentiment is by Papertrey. All card stock, ink and accessories are @Stampin' Up. 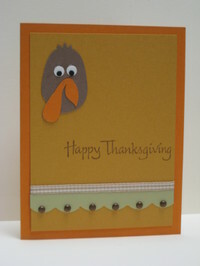 My friend, Jenny, really liked this card so I'm going to make a set for her. My own Christmas cards are completed and ready for mailing. I just need to buy Christmas stamps and then I'll mail them in early December. Christmas is just around the corner, you know! The tablecloth is ironed, the table is set, the serving dishes are sitting on the counter waiting to be filled, the turkey is in the oven. I know you're saying, "Wait a minute, what day is this?" Hee hee hee...no, it's not Thanksgiving. We alternate every year between having Thanksgiving on Thursday and having it on Saturday. I'm usually pretty good at remembering which day we had it on last year, however, this year I couldn't remember. It turns out we had it on Saturday last year too. My mom is making the dressing and the pumpkin pies. Lisa is bringing the pickles, olives, cranberry sauce and rolls. I'm making the green bean casserole, mashed potatoes and corn...oh, and the turkey, of course. No, we don't brave the crowds at the malls on Black Friday. We used to but I don't have the patience to deal with having to drive around to find a parking place and I'm certainly not going to get out of my nice warm bed at 4:00am in order to take advantage of the sales. I do love to go Christmas shopping though. In fact, my friend, Jenny, and I have planned a day of shopping on December 1. I brewed a batch of Fat Bumpkin Pumpkin Ale today. I love the smell of the grains and hops that fills the house when the beer is brewing. This particular beer smells even more wonderful because it calls for the addition of pumpkin, cinnamon, nutmeg, allspice and ginger. Yummy! I thought I'd share my turkey day creations with you. 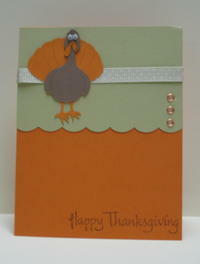 This is the Thanksgiving card that I sent to family and friends. 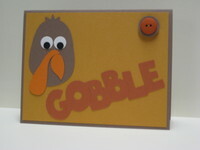 I used the Cricut to create the turkey and then added googlie eyes. He cracks me up! Be sure to click on the photo for a closer view. 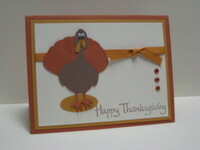 My friend, Jenny, needed a few Thanksgiving cards for her grandchildren so I gladly created these four cards. I used the Cricut for these cards too. All card stock, ink and accessories are @Stampin' Up. This card isn't really my usual style. I don't often use black unless it's for a Halloween card but, in this case, it just seemed to fit. I cut a piece of designer paper and stamped one of the images from Polka Dots and Paisleys in each circle. I used my stamp-a-majig to center the images. I then layered it on black and attached it to the card. The sentiment is from Amuse (I love their sentiment stamps) and was stamped in black. I added two black brads to the top and, viola, the card was finished. Quite easy. I didn't have any black brads. The black brads used on this card were actually silver. I heated then with my embossing gun, stuck them into black embossing powder and heated it again. Pretty cool, eh? No, I didn't think that up all by myself. It was a nifty tip posted on Splitcoast Stampers. I created a gallery on the site which can be viewed by clicking here. Most of the recent cards in my gallery are also posted on my blog but you'll also find some of my earlier creations (pre-blog days). Be sure to check out this great site. You may remember my previous post regarding our TV problems. You can read the post by clicking here. I just wanted to give an update on what has happened since that post. LG Electronics requested a copy of our receipt and they then sent a certified letter to us. Basically the letter stated that the light engine was not the cause of the blue haze problem and that they were not responsible, however, in good faith, they would replace the part. The repairman replaced the light engine today and guess what! The blue haze is gone. Hmmm, if the light engine was not the cause of the problem, why did the blue haze disappear when the part was replaced? OK, I'm just happy that it's fixed but I guess there is no guarantee as to how long this new part will last. We're planning to buy a new TV in the next few months and we'll move our current one upstairs to the TV room. We ate at Elephant Bar tonight. Yummy. I ordered the crispy chicken teriyaki...yummo! We also had the coconut shrimp skewers as an appetizer. In addition to the great food, the entire restaurant is "no smoking." Woohoo! You don't have to worry about breathing cigarette smoke while you're trying to enjoy your meal. That reminds me of that Irish Spring soap commercial from the 70's...hee hee hee. Ok, back to the subject. I always find it more difficult to create masculine cards. I mean, I have so many flower and girly stamps and they obviously don't work well for this type of card. That being said, when I created this card, I started with a ribbon from Michael's (brand unkown) and a couple of pieces of Hodgepodge Hardware. The colors in the ribbon dictated the colors that I used...Chocolate Chip for the card base, Very Vanilla for the first layer and Brocade Blue for the top layer. A piece of Chocolate Chip card stock was attached diagonally and the sentiment was then layered on top. Not much stamping but I really like the finished product. All card stock, ink and hardware are @Stampin' Up. Image by Hampton Art. Back to my "stamping studio"...hee hee hee. More cards to follows. I love my Prima flowers. They are so darn cute! Here's my latest creation using these little blossoms. 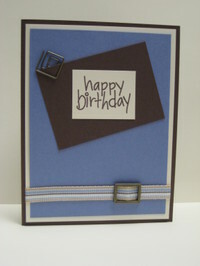 I used Buckaroo Blue for the card base. I added a strip of Soft Sky and then punched squares out of Whisper White, Blue Bayou, Blush Blossom and Sage Shadow. 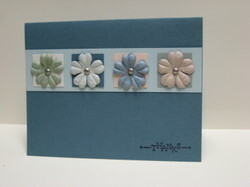 I attached the squares to the strip of Soft Sky and then attached the flowers to the squares using brushed silver brads. The sentiment is by Lockhart Stamp Company and was stamped in black ink. All card stock and ink are @Stampin' Up. I seem to be using more and more designer paper in my creations. 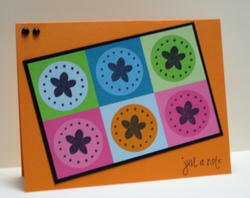 For this card, I chose a piece of paper from the Creative License Scrappin' Kit from @Stampin' Up. I used Soft Sky for the card base and then layered a piece of the designer paper on Groovy Guava card stock and attached it to the left side of the card. I cut a piece of Wild Wasabi card stock and then used the ticket corner punch on the corners. 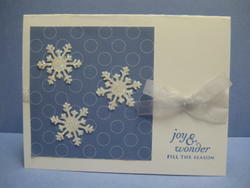 I layered this on a piece of Buckaroo Blue and attached it to the right side of the card. 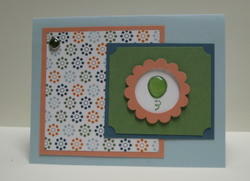 I chose the balloon image from the Mini Messages set and stamped it with Wild Wasabi on Whisper White. I added Crystal Effects to the image to create a shiny, raised surface. I punched it out using a circle punch and attached it to the card. I punched a smaller circle in Groovy Guava and then centered the scallop punch over the cut out and punched it out. I layered this "frame" over the stamped image using dimensionals so that it was raised up slightly. A green jewel brad by Making Memories was then added to complete the card. All card stock, ink and images are @Stampin' Up. I ordered some beer making supplies yesterday. I haven't brewed a batch of beer in quite a while but I'm planning to brew two different batches in the next few weeks. Did you hear about the hop shortage? It's true. Luckily, my main supplier of beer brewing supplies, William's Brewing, had the hops I needed. Cheers.